Motorists travelling on the M61 southbound near Chorley are being diverted to the M6 at Bamber Bridge due to carriageway repairs. Highways England are advising people heading south on the M61 to join the M6 southbound at junction 29 (Bamber Bridge) to avoid congestion at M61 junction 9 (Brindle). 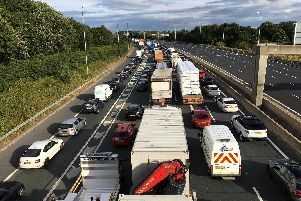 Motorists on the M61 are being advised to join the M6 southbound at junction 29 in Bamber Bridge after Highways closed a stretch of the M61 near Chorley for carriageway repairs. The M61 carriageway will be temporarily closed as emergency repairs are made to a stretch of lane 3 at Brindle, near Chorley, this morning. 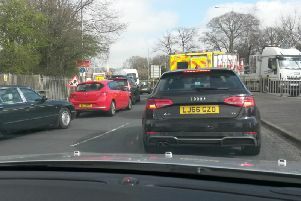 Highways officers are asking people to use an alternative route to avoid congestion. Motorists can follow the M6 southbound to junction 29 at Bamber Bridge before heading east on the M65 to junction 2.